Matt Damon stars as an up-and-comer politician who has his heart set on being elected Senator. His whole life is planned out and organized, then he meets Emily Blunt and the two hit it off. The only hitch is, they are never supposed to meet again. Enter the men with hats. They are the agents of fate and do everything in their power to stop the two from being together. I like that they explore free will vs. fate throughout the movie but there isn't much of a plot to connect it to. The hatted men are hardly evil enough to be great villains and you never truly find out their reason for keeping the two apart. The aspect that keeps this movie afloat is that the chemistry between Damon and Blunt is actually believable. I'm not a fan of love stories in any movie but it really does hold this one together. I don't know if anyone will admit to it, but there are many who probably didn't understand the complexity of Inception. To be honest, I don't know if anyone but Christopher Nolan himself fully understands WTF is going on. 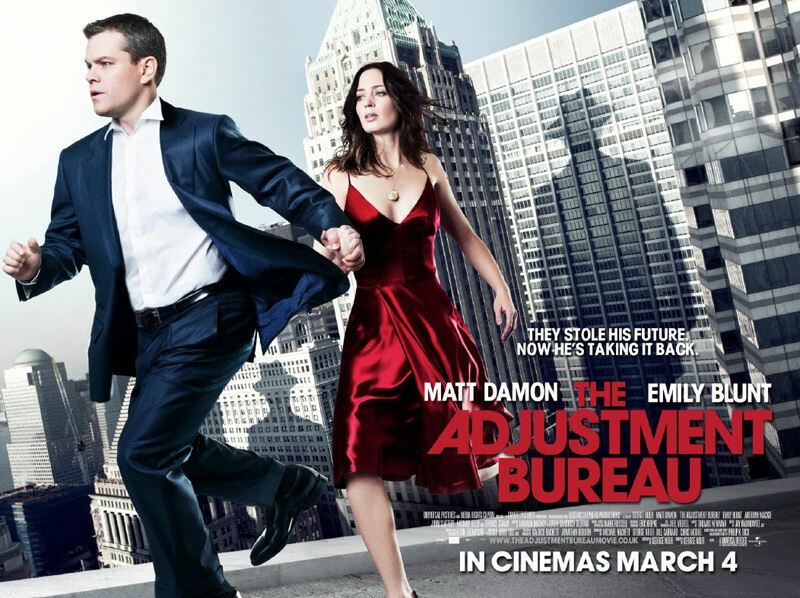 The Adjustment Bureau is made for those people who want a movie to be unconventional but not so smart that it challenges the audience, as with Inception. There are definitely interesting ideas that go into Bureau but it seems as if they've been borrowed from better sci fi movies. As I said, I went into this movie with low expectations and I was pleasantly surprised. I recommend you do the same. It's a movie that will make you think, if only till the credits roll. The Adjustment Bureau receives 3 large stars.